The absence of leg-space on my flight from Doha to Beijing made for a pretty tiring flight, standing up for most of the journey, but it did have one benefit. 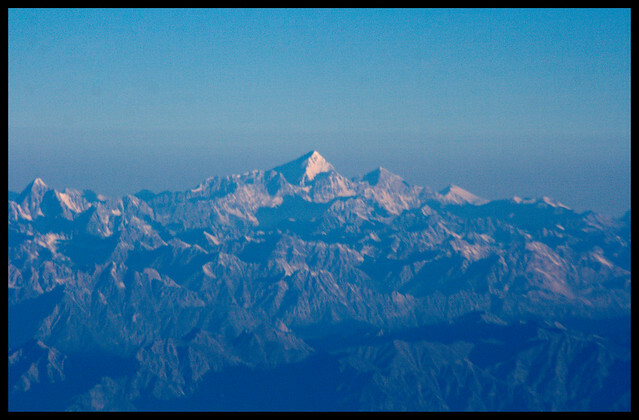 As the sun rose and the Earth-shadow slowly faded, the sight revealed below was the foothills of the Himalayas, a sight I'd never seen before. I watched the peaks rising from the gently rolling hills, and in the distance a familiar sight appeared. The light was still relatively low, and perching by the emergency exit, peering through the small window made for awkward photography, but this was one of the first shots I took of it. I'll try and process some more of the photos from this series in the next week or so. If I'm mistaken and somebody knows better then please tell me, but I've compared this image to others in google and the surrounding peaks look right.